Palestinian amora of the first half of the third century. He was the head of the school of Lydda in southern Palestine, and an elder contemporary of Johanan bar Nappaḥa and Simeon b. Laḳish, who presided over the school in Tiberias (Gen. R. xciv.). With the former, Joshua often engaged in haggadic discussions (B. B. 116a; Meg-27a; Shebu. 18b). It is doubtful whether the words "ben Levi" mean the son of Levi, whom some identify with Levi ben Sisi, or a descendant of the tribe of Levi (Grätz, "Gesch." iv. 263; Frankel, "Mebo," p. 91b; Weiss, "Dor," iii. 60; Bacher, "Ag. Pal. Amor." i. 124). 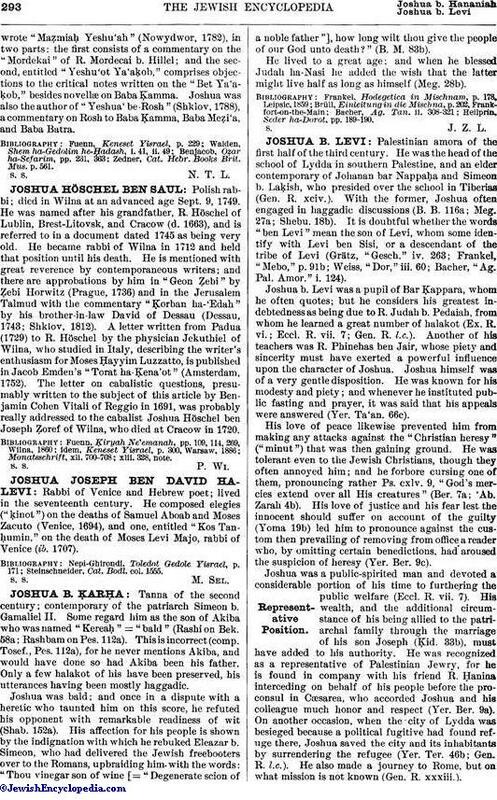 Joshua b. Levi was a pupil of Bar Ḳappara, whom he often quotes; but he considers his greatest indebtedness as being due to R. Judah b. Pedaiah, from whom he learned a great number of halakot (Ex. R. vi. ; Eccl. R. vii. 7; Gen. R. l.c.). Another of his teachers was R. Phinehas ben Jair, whose piety and sincerity must have exerted a powerful influence upon the character of Joshua. Joshua himself was of a very gentle disposition. He was known for his modesty and piety; and whenever he instituted public fasting and prayer, it was said that his appeals were answered (Yer. Ta'an. 66c). His love of peace likewise prevented him from making any attacks against the "Christian heresy" ("minut") that was then gaining ground. He was tolerant even to the Jewish Christians, though they often annoyed him; and he forbore cursing one of them, pronouncing rather Ps. cxlv. 9, "God's mercies extend over all His creatures" (Ber. 7a; 'Ab. Zarah 4b). His love of justice and his fear lest the innocent should suffer on account of the guilty (Yoma 19b) led him to pronounce against the custom then prevailing of removing from office a reader who, by omitting certain benedictions, had aroused the suspicion of heresy (Yer. Ber. 9c). Joshua was a public-spirited man and devoted a considerable portion of his time to furthering the public welfare (Eccl. R. vii. 7). His wealth, and the additional circumstance of his being allied to the patriarchal family through the marriage of his son Joseph (Ḳid. 33b), must have added to his authority. He was recognized as a representative of Palestinian Jewry, for he is found in company with his friend R. Ḥanina interceding on behalf of his people before the proconsul in Cæsarea, who accorded Joshua and his colleague much honor and respect (Yer. Ber. 9a). On another occasion, when the city of Lydda was besieged because a political fugitive had found refuge there, Joshua saved the city and its inhabitants by surrendering the refugee (Yer. Ter. 46b; Gen. R. l.c.). He also made a journey to Rome, but on what mission is not known (Gen. R. xxxiii.). Although R. Joshua b. Levi was connected through family ties with the patriarchal house, and always manifested his high esteem for its members (Ḳid. 33b), yet it is largely due to him that the friendship between the southern yeshibot and the patriarchal house diminished (that such friendship existed see 'Er. 65b; Yer. Pes. 32a). For Joshua was the first to ordain fully his own pupils in all cases where ordination was requisite (Ned. 42b), thus assuming a power that hitherto had lain in the hands of the nasi alone. In the field of Halakah Joshua was of considerable importance, his decisions being generally declared valid even when disputed by his contemporaries R. Johanan and Simeon ben Laḳish. He was lenient, especially in cases where cleanliness and the preservation of health were involved (Shab. 121b; Yer. Yoma 44d). Joshua devoted himself to the elucidation of the Mishnah; and his own halakot resemble in their form and brevity the mishnayot of the Tannaim. In the Haggadah, however, he is even of greater importance. Of that study he entertained a high opinion, and he explained Ps. xxviii. 5, "the works of God," as referring to the Haggadah (Midr. Teh. xxviii. 5). Similarly in Prov. xxi. 21 he identifies "glory" ("kabod") with Haggadah (B. B. 9b). There is also a reference to a book ("pinḳes") by Joshua ben Levi which is presumed by some to have presented haggadic themes (Weiss, "Dor," p. 60); but this can not be well reconciled with the fact that Joshua disparaged greatly the writing down of haggadot (Yer. Shab. 15c; Midr. Teh. xxii. 4; Bacher, l.c. p. 129, against Weiss, l.c., who assumes that the "pinḳes" was the work of another rabbi of the same name). It is beyond doubt, however, that the Haggadah occupied a very important place in the teaching of Joshua b. Levi; this is evident from the many haggadot quoted in his name directly or given in his name by his disciples and contemporaries. As an exegete Joshua b. Levi is of some importance, his interpretations often enabling him to deduce halakot. Some of his explanations have been accepted by later commentator (e.g., Ibn Ezra and others on Ex. xv. 1; see Ex. R. xxiii.). Joshua b. Levi was an earnest student, and his emphasis of study is seen when he speaks of God as saying to David (Ps. lxxxiv. 11) that "better" in His sight is "one day" of study in the Law "than a thousand" sacrifices (Mak. 10a; Midr. Teh. cxxii. 2). Though learning is of paramount importance (Meg. 27a), still he also insists on piety. He who attends morning and evening the synagogue service will have his days prolonged (Ber. 8a), and he who moves his lips in prayer will surely be heard (Lev. R. xvi., end; Yer. Ber. 9d). He instituted a number of rules regulating the reading of the Law in the synagogue on week-days (Ber. 8a) and other matters relating to the service, many of which are to this day in force in the synagogue (Soṭah 39b). Some of Joshua's philosophical and theological opinions are recorded. Speaking of the attributes of God, he represents Him (Yoma 69b; Yer. Ber. 11c; Yer. Meg. 74c) as "great, mighty, and awe-inspiring" (Deut. x. 17). He conceives the relation between Israel and God as most intimate, and he expresses it in the words, "Not even a wall of iron could separate Israel from his Father in heaven" (Pes. 85b; Soṭah 38b). In his doctrine of future reward and punishment, paradise receives those that have performed the will of God, while the nether world becomes the habitation of the wicked ('Er. 19a). In Ps. lxxxiv. 5 he finds Biblical authority for the resurrection of the dead (Sanh. 91b), and in Gen. R. xxvi. he expresses the liberal view that immortality is the portion not only of Israel, but of all other nations as well. In a legend (Sanh. 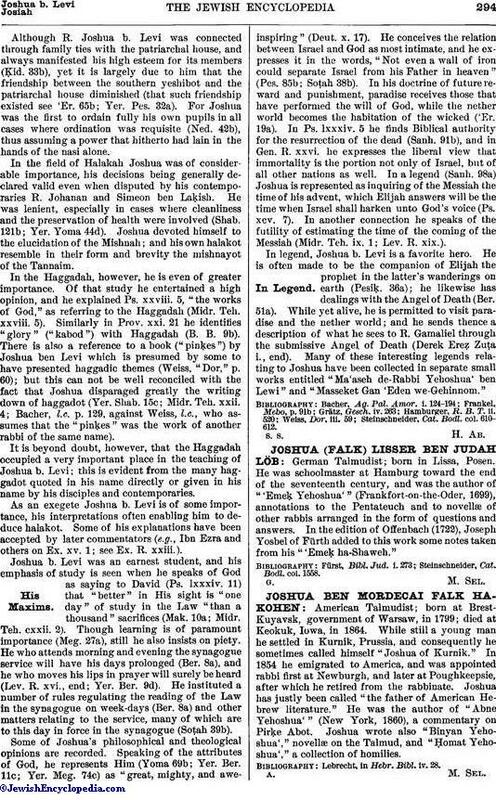 98a) Joshua is represented as inquiring of the Messiah the time of his advent, which Elijah answers will be the time when Israel shall harken unto God's voice (Ps. xcv. 7). In another connection he speaks of the futility of estimating the time of the coming of the Messiah (Midr. Tch. ix. 1; Lev. R. xix.). In legend, Joshua b. Levi is a favorite hero. He is often made to be the companion of Elijah the prophet in the latter's wanderings on earth (Pesiḳ. 36a); he likewise has dealings with the Angel of Death (Ber. 51a). While yet alive, he is permitted to visit paradise and the nether world; and he sends thence a description of what he sees to R. Gamaliel through the submissive Angel of Death (Derek Ereẓ Zuṭa i., end). Many of these interesting legends relating to Joshua have been collected in separate small works entitled "Ma'aseh de-Rabbi Yehoshua' ben Lewi" and "Masseket Gan 'Eden we-Gehinnom." Steinschneider, Cat. Bodl. col. 610-612.